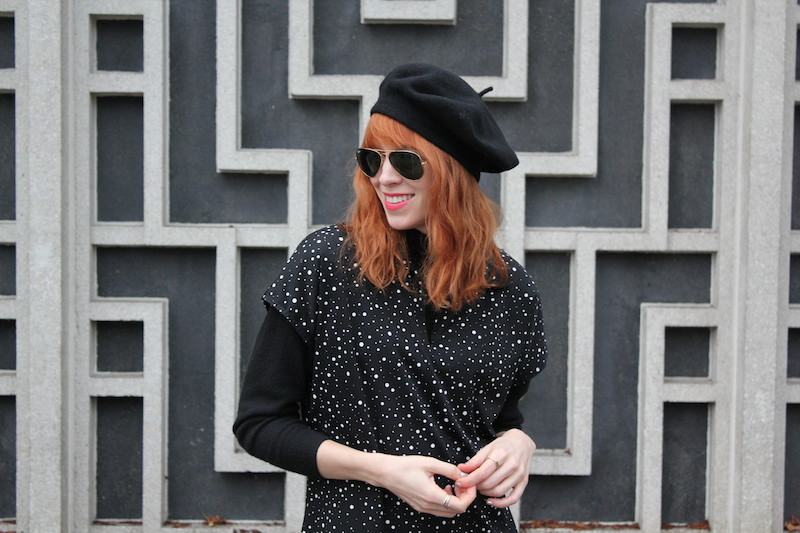 This is my first outfit post since moving to Seattle! As you can see, it's raining outside, but I still prefer this weather to Minneapolis' sub-zero temps. I wore this vintage dress to work last week, with a few minor tweaks (long-sleeved shirt underneath, no bracelet). It's been in my closet forever. I love how it has a crazy psychedelic floral print, but the silhouette is quite simple and ladylike. No need for tons of accessories or anything but basic black accents. I'm also so excited to finally wear the pearl earrings from Tiffany that my boyfriend got me for Christmas! I only just got my ears pierced this fall (I know, I know), and it's been so hard seeing them on my jewelry display while I waited to remove my "starter" studs. No one jaywalks in this town, to an alarming degree. The street could be completely bereft of cars and bikers, and everyone will stay perched on the sidewalk, waiting for the walk sign to light up. I, of course, do not pay attention to walk signs — I pay attention to cars. But I guess if jaywalking tickets are common in this town, I guess I should pay attention to police cars too, heh. Everyone here thinks 40 degrees is unbearably cold. This is hilarious. Where I come from, unbearably cold is more like 10 degrees and under. And windy. If it's not windy, anything's manageable. For the most part, Capitol Hill, my neighborhood, reminds me a lot of Uptown Minneapolis, my old neighborhood ... except after 2am on weekends when it suddenly turns into the Lower East Side. The streets are packed, food trucks are out and it's like a dance party. There are pho restaurants everywhere. EVERYWHERE. I'm not yet sure how I feel about this. Never been the hugest pho fan, but maybe I just haven't had the best stuff. Pretty much every Seattleite I've met thinks Minneapolis is flyover country, which makes me a little sad. I'm convinced every one of them would love Minneapolis if they visited simply because it's so damn similar to Seattle. They have no idea! locally owned boutiques for all kinds of stuff — clothes, yarn, skateboards, shoes, gifts, vintage, etc. This last one might actually apply to every city on the planet. Discussing the weather seems to be part of human nature. All in all, I really like it here so far! More to come soon, including photos from my 'hood.